For his exploits and astuteness, Roland de Vries has rightfully been called the ‘Rommel of the SADF’. In this forthright, warts-and-all but compassionate autobiography he recounts the fascinating story of the transformation of a small, colonial army into, pound-for-pound, the best fighting force on the planet. "Eye of the Firestorm" could be used to enhance the teaching within the military, security and leadership development. In a sense, this is an easy-to-read text book with many real-life examples of young leaders and commanders within the domains of the defense and security. It is a soldier's life story about how he lived through the South African Border War and the transformation that followed when South Africa became a fully democratic State on 27 April - it is also about gaining perspective in life. This book puts in perspective the African way of warfare and expounds about operational concept tactics, terrain, command and leadership displayed from opposing sides. 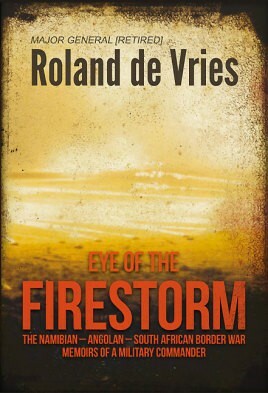 Eye of the Firestorm tells about a free-spirited man who breaches the conventional and challenges the traditional. Roland de Vries believes with a passion that strength lies in the many rhythms of maneuver and by being surprisingly different. This book weaves a fabric of richness to life in the military as well as the South African Border War. It covers a military career spanning over 37 years. Expect the unexpected from a man who believes that those who are entrusted to him count and need to be given the best fighting chance in life. That there is hope for the future, that there is always a way and that we can fight our way through any firestorm!